Wandering through Victorian cemeteries in Scotland and England, it is highly likely that you will run into a few graves that have large iron grates over the top of them. One of the theories behind the purpose for these large rodded contraptions is that they were meant to prevent the dead from coming back to life either as vampires or zombies. The only problem with this theory is that vampires didn’t become a major fear or even part of general UK knowledge until the end of the 19th century, and the mortsafe was invented in 1816. Nor were zombies particularly part of the urban lore during this period. There was a more real threat that worried the deceased and the living: body snatchers. To begin, Christianity requires that the body remain intact in order for it to be resurrected. In the late 18th century, the need for the recently deceased for anatomical dissection for medical education meant that not all bodies went into the grave intact. Initially, the individuals chosen for dissection were criminals or the unidentified deceased. However, by the early 19th century this group didn’t provide enough cadavers to meet demand. Medical schools began paying for bodies from anywhere- thus beginning a trend of body-snatching. Body snatching involved the removal of the recently deceased from their coffins. The fresher the bodies the more money they would get for them at the medical school. At first, police turned a blind eye to the practice since it benefited science and medical education, but rioting and panic set in when the public learned of what was happening. It didn’t take long for relatives of the dead to realize that their loved ones were no longer safely buried within the ground. In order to prevent desecration of the body and protect the dead, the wealthy began to bury with larger stone tablets or within locked vaults. The poor set up watches around the graveside and placed items on top of the grave in order to determine if it was disturbed. Night watchmen were posted in cemeteries. Many of these methods failed. Snatchers learned to dig around the stone tablets or break into vaults, and watchmen were easily paid off. A better option was to install a mortsafe. The mortsafe is a large iron grate that was placed over the grave to prevent thieves from digging up the coffin. The cage is partially buried within the grave and surrounds the entire coffin. After a suitable amount of time, allowing for decomposition, the mortsafe was removed. Another version lacks the grating and is made completely of iron plates. Most found are simple single coffin shaped grates. 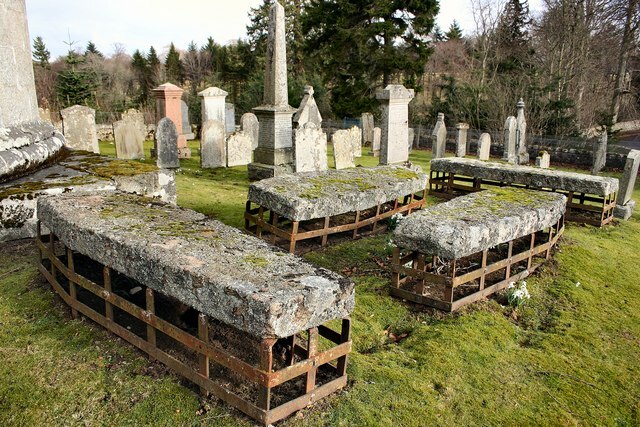 Although some of the mortsafes seen throughout Scotland are quite elaborate with the ability to hold multiple coffins. One model in Greyfriar’s Kirkyard holds three spaces for coffins, has a complex padlock system with interlocking bars, and can only be opened when two locks with different keys (often given to two separate church members) are released. 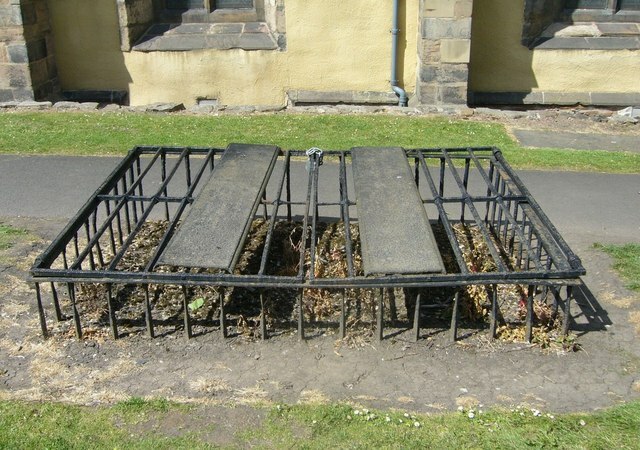 The family could either purchase a mortsafe or they could rent them from the church or cemetery. While they were extremely effective in preventing disturbance of graves, they were a hassle to put in and remove. It is because of this hassle that some of the mortsafes still remain in cemeteries protecting individuals long since decomposed. Most of the mortsafes have rusted or been removed. We see them more in areas that were close to anatomy schools, especially those surrounding Edinburgh. Following the Burke and Hare murders, the number of mortsafes in cemeteries dramatically increased. Burke and Hare became famous not for their body snatching (although they did a fair amount of that) but for the individuals they murdered and sold to medical schools. It was after this calamity that the general public became highly aware of what was occurring and deeply concerned about the integrity of the bodies of their deceased loved ones. If you would like to see a mortsafe, you can check out this handy map which includes the location and image of mortsafes discovered throughout the UK. Why is this important to know for archaeology? First of all, we may find these cages present at some archaeological sites and it is important to understand that they have a practical purpose rather than more mythical or religious one. Second, we may be able to identify post-mortem disturbance within a Victorian grave that appears otherwise intact. This disturbance could be a sign that it was excavated twice: once to put a mortsafe in position and the second to remove it. It is important when excavating a site to understand as many potential mortuary factors as possible. If post-burial of the grave is a possibility, we need to consider how this may change our archaeology. ← Happy 2nd Birthday BDL! I cannot read the post … technical prob ? Still having problems? I accidentally published it early which may have caused problems! How ironic! I’m writing this from Scotland (Edinburgh), and have indeed wandered around cemeteries in London, Glasgow and here. The Glasgow necropolis is particularly incredible. I do like this new series. I was actually considering a series similar to this for my own blog, which I was considering calling “Funeral Terminology.” Of course, it would be modern in its focus and there probably would be some overlap with terms that are now considered to be outmoded. Still thinking on it. Anyway, I look forward to the next installment of this series! On this fascinating topic, I highly recommend as a primary source, a book titled “The diary of a resurrectionist 1811-1812, to which are added an account of the resurrection men in London & a short history of the passing of the anatomy act (1896)”, which can be read or downloaded here. While you are partially correct, your opening statement about the absence of knowledge of vampires is incorrect. The first English Vampire literature was Coleridge’s Christabel, published in 1797. Later came Lord Byron’s The Giaour from 1813, and Polidori’s The Vampyre from 1819. In addition, there are ample reports of people being buried alive and returning from the grave, throughout the 17th and 18th centuries in England. This likely came from the misunderstanding of death and how it worked. In fact, the medical community termed the recently dead as the apparently dead throughout the 18th century. You may also want to do further reading on safety coffins.